Are you looking for wholesale flooring prices and quality products to finish	your upcoming flooring project? Many of our customers have said that Specialist	N Flooring is Riverside County’s low priced quality flooring specialist. We are very proud of this title, and are dedicated to providing this type	of quality to our residential and commercial clients. This is why we only	work with the best manufacturers, such as Mohawk, Shaw, Tuftex, Royalty	Camelot, and Beaulieu. Laminate	: This is a very common choice in houses with big families. The reason for	this is because it is easy to clean and maintain. Although it is more	cost-effective, laminate is incredibly durable and can be found in virtually	any style, including hardwood patterns. Engineered Hardwood	: Engineered Hardwood is one of the most elegant and beautiful types of floors. It can add a touch of style to any room in the home. We offer a wide variety	of colors and grain styles in our warehouse. Tile	: Tile is most popular in bathrooms and kitchens because it is durable and	long-lasting. It can be placed in virtually any room, and can be customized	to your taste and color palette. This allows you to match the tile to	your existing paint job or start over entirely. Carpet	: The great thing about carpet is that it is easy to customize. 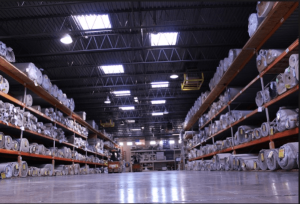 In our warehouse,	we have a seemingly endless variety of options, including different sizes	and colors. When you put carpet in your home, you can easily find something	that matches your vision. We hope that you will be satisfied working with us once you witness for	yourself the quality of our products and attention to detail. Our customer	service and high level of respect for our clients has earned us a positive	reputation over the years. For more information, call us today or come into one of our warehouses	to see for yourself!